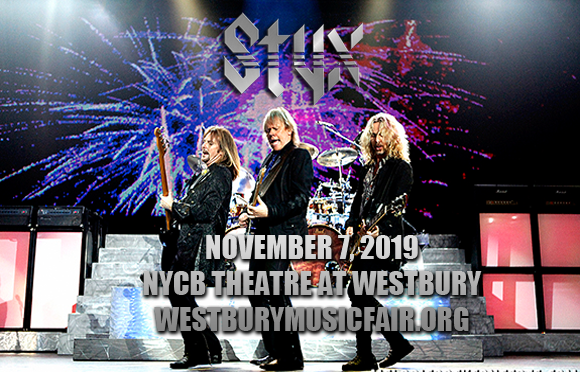 One of the hardest-working bands in the industry, arena rock veterans Styx are headed to NYCB Theatre at Westbury on Thursday 7th November 2019 for a very special show! This summer, the band embarks on the "Laugh. Rock. Seriously." tour, teaming up with blue-collar comedian Larry the Cable Guy for something new and exciting, not to mention hilarious! A household name throughout the 1970s and '80s with a string of hit singles (including "Lady", "Come Sail Away", "Babe", "The Best of Times", "Too Much Time on My Hands" and "Mr. Roboto"), Chicago-based rock band Styx began their career in 1972 when they were signed to Wooden Nickel Records after being spotted by a local talent scout. Five years later, their mainstream breakthrough came with the release of their seventh studio album, The Grand Illusion, which was the first of four consecutive multi-platinum-selling albums for the band: The Grand Illusion (1977), Pieces of Eight (1978), Cornerstone (1979) and Paradise Theatre (1981). After a decade-long hiatus in the mid-1980s, the band came together again in 1995 and have continued to tour regularly ever since. The band's most recent record, a concept album called The Mission, was released in 2017.